The personal and the political clash in The Party, the first film from Sally Potter since 2012’s Ginger & Rosa. It’s a curt, nasty and deftly acted chamber piece high on laughs and savagery about frustrated idealism and how little it takes to make society fall to pieces. 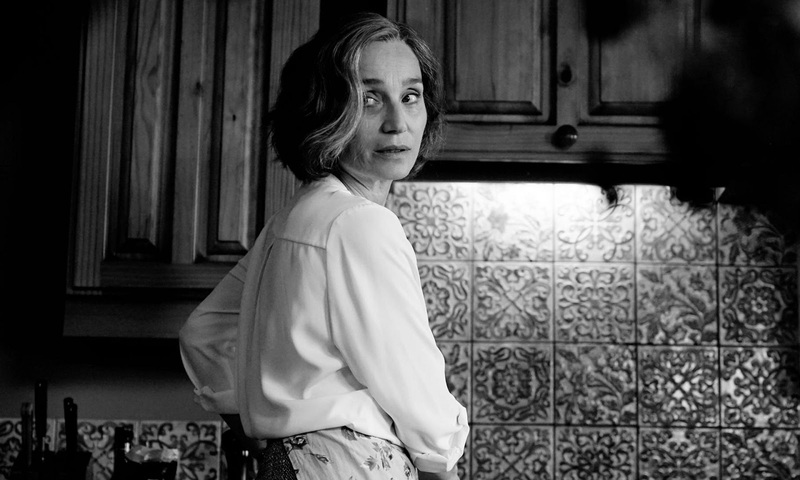 The film opens with a striking shot of an incredibly flustered Janet (Kristin Scott Thomas), opening the front door and pointing a gun at the camera. It’s not the type of welcome you’d expect from a civilised dinner party, but it’s clear very early on that this celebration is going to end in tragedy. The title credits roll, and the clocks turn back a few hours to Janet’s husband Bill (Timothy Spall) pouring a glass of red wine and putting on a record in anticipation of the party they’re having to celebrate Janet’s appointed as the shadow health minister for “an entirely useless opposition party”. Indeed, anyone familiar with the state of politics in the UK will find Potter’s latest a fascinating window into the fractured identity of British Left wing politics. As the guests arrive and polite-chitchat morphs into more philosophical conversations about health, feminism and class, the atmosphere is suddenly tainted by two unexpected revelations. The party takes an unexpected turn and this small group of seemingly well-adjusted people eventually starts baring their teeth, claws and souls. Well except for April (Patricia Clarkson) who, from the very moment she enter the flat, proceeds to move from room to room like a whirlwind of barbed opinions and observations that are perceptive to the point of being wicked. It’s a role Clarkson clearly enjoyed sinking her teeth into, and by the end of the film you can almost see the blood dripping from the corner of her wry smile. The film’s basic dramatic format will be familiar to anyone with a passing acquaintance with modern theatre. Potter, a former theatre director, is evidently comfortable working in such close quarters, and The Party feels like a stage adaptation, although that’s not to say its lacking in cinematic quality. Shot in exquisite black-and-white, Alexey Rodionov’s camera weaves its way effortlessly around this cramped London flat, always managing to position itself in exactly the right place at exactly the right time. Another theatre trope that manifests across the course of the evening is the old adage known as Chekhov’s gun, but even though one of the guests arrives with a pistol it’s the loaded language and cutting criticism that do the most damage here. However, despite the film’s loquacious charms, its what’s lurking in the pregnant pauses of these funny, yet vicious diatribes that gives The Party its raison d’être, and if you look closely you can practically see the throbbing veins of class consciousness.